Am working on my first ever RC project, which involves a 47cc McCulloch chainsaw motor. Just thought I'd throw you a couple of pictures and see what your comments are. A lot has changed since these pictures, but the general setup is still the same. It will run from 14 cogs from the sprocket on the motor, to 28 cogs on the first axle, then another chain from the small one (14 cogs again) to the large one on the rear axle, which is also 28 cogs. Note how well the hub, holding the sprocket fits on the teeth on the clutch. Like it was made for it. Interesting project! I've toyed around with the idea of using a derailleur but never had the space for one. What scale are you going for? I'm interested in seeing how this pans out. Looks interesting,and promising!I was thinking a lot of this too,using the derailer from a bicykle to change gear while driving.But this was too much for me to have enough creativity for Looking forward to follow this thread! will the rear axle work freely as a one way , like a bike? Or are you going to lock it up? Ok, I'm not going to use the gearchange thing from the bike. Just go from small to large to small to large. So that will make it a 4:1 ratio no? Still thinking about the freewheel thing on the rear axle. Suppose it would come i handy. I've been in contact with [link=http://www.ericstoffers.com/loves/radio-control/home-made-car/default.asp]this[/link] guy and he's running a similar setup. Lars - I've already studied Giorgos pictures closely, but will have a look at yours later as well. It will be mainly for beach use, as we live about 5 min walk from the ocean. 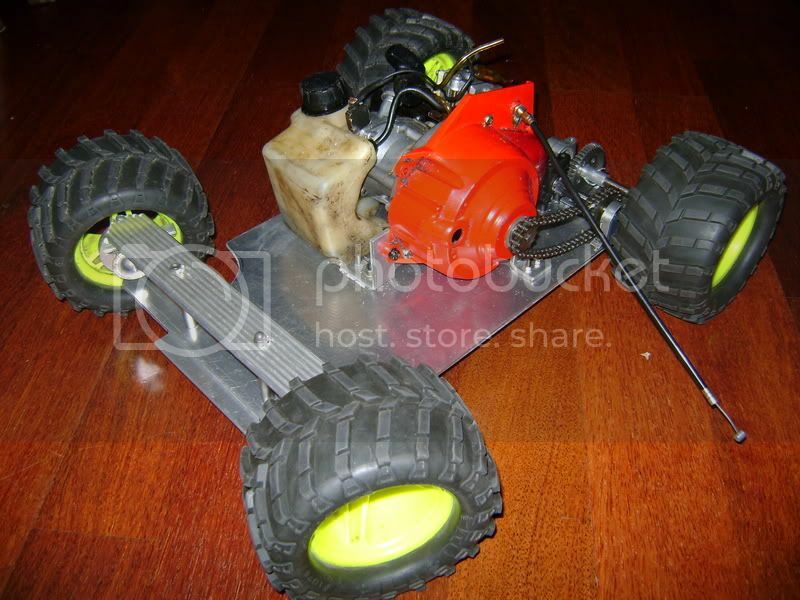 I'm looking at getting [link=http://www.gadgetgalaxy.com.au/Land%20Overlord%20Nitro%20Truck%20Spare%20Parts.ht m]tires[/link] from the Heng Long Overlord monster truck for it. I think I'll be right at home here with you guys! I'v made a few useing the same type of chain saw and and set up you have to make it drive on BMX bikes made to fit over the back wheel. I went small to small sproket and i could do 80 to 85k's with it went crazy i also put one on a 16in pushy that was just nuts death wobels at 70 to 75k's not fun, well yes it was but it was biteing teeth moment thats for sure. So it does work and that on a BMX bike with me on it (i was 65 to 70kg) and had no bog and would rev. I did make my own stinger pipe for it stainless pipe to run exhaust out the back that made it go harder and not as noisy to. I did jump it and did not have any probs. It went up hills with no prob and if you did peddel as well it flew up hills. 40 min max run time flogging it 50min near full flogging it. Ok, here are a few pix of today's effort. I had to move everything over to the right, as I originally had it set up for a whippersnipper/weedwacker/grasstrimmer/weedeater/strimmer/whatever they call it in your part of the world motor. And the drive was of course on the other side. But - after a number of beers and lots of fiddling it is now set up for the chainsaw motor. Lars - I had a look at your car - Amazing. Very good attention to detail and well made. I like how you did the steering, which is going to be my next headache once the motor and gears is all set up. 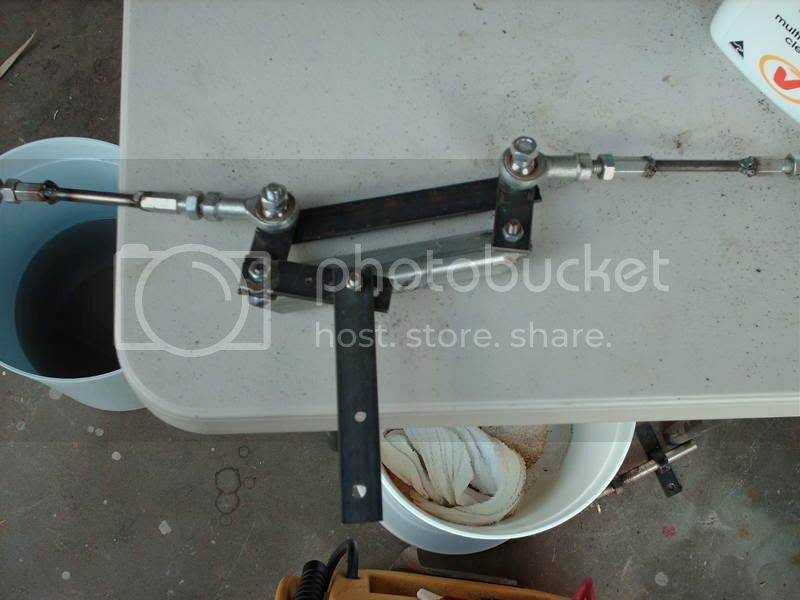 I'd be interested in pictures of people's home made steering setups as well, as I most likely will make it up myself. Trying to avoid buying parts as much as possible, and make it up from what I have laying around at home. Mazda ute - a lot of the kids here are putting chainsaw/whippersnipper motors on their bikes. One guy had a roller on the driveshaft and just had that running against the rear tyre - not as fast as what you're talking about but it was still moving pretty good. Do you have any pics of how you made the exhaust pipe for the chainsaw? I figure that the original one will have be replaced. Also - once I get this thing going, I will build a new, better looking frame for it, but I don't want to get too far ahead of myself. What's the motor in that buggy in the video?!?? Before I posted that last message I had typed out another one that got lost in cyberspace. I remember now that I was gonna ask you guys about the weight of your projects. I haven't put mine on the scales yet (come to think of it, I don't think we have any... ) but I don't think it's THAT heavy. [b]One guy had a roller on the driveshaft and just had that running against the rear tyre - not as fast as what you're talking about but it was still moving pretty good. I'v done that as well used a bit of nylothan to drive on top of the back wheel useing a smoth road type tire got about 60 to 70km's max useing a 23cc wipper snipper running race fuel and 20% nitro mix it went realy well about 1hr run time out of that one. The pipe i made was made out of around 20mm ID stainless pipe made to suit were it had to go it came out the side about 80mm then went back 160mm from the 90 deg and angled down 30 to 40 mm.Did not seem to loose back presher at all. My car ended up on 11,6 kg (ready to run with body),i am very pleased with that as i thought it would end up on about 13-14 kg without body!I cant say i have tried my best to get it as light as possible either,i guess i could have got it down to the lower 10's if i really put my mind to it. Don't think mine's even that heavy at the moment, but there's still some stufff to be added to it. Will go and borrow some scales off a mate today and see where I'm at. Where did you get the gear setup for your car? Is that something you bought from an RC shop or did you make them yourself? Obviously they would be a lot lighter than the bicycle gears I'm using at the moment, and in the future I might be looking at doing something like that as well. Well, I'm not really going for a scale as such, and while I was looking at the 1:8 monster truck wheels earlier I'm thinking that I might have to go a bit bigger for more clearance. The Heng Long wheels would bring it up another 10 mm tops, and I'm not sure I'm happy with that. I'm a bit concerned about the weight distribution as well, and am thinking that the motor might be sitting a bit high. I'll take some more pix later today and you can have a look. So you just go all "World's Fastest Indian" and pop a nitro pill in the tank of a normal chainsaw motor? Does that put extra stress on the motor - I guess it would as it will run harder, no? I was really hoping that I'd be able to fire it up on the bench this weekend and give the rear axle a go, but I broke 2 teeth off the sprocket when I tried to get it off the hub. About your tire quandary, I guess I would ask if you're thinking of adding suspension as well, as I don't think you mentioned it. From the looks of it I guess you're going for a solid rear end? I went a fairly simply route and used some T-Maxx parts that you can see in one thread on my car [link=http://www.rcuniverse.com/forum/m_8272667/anchors_8272667/mpage_1/key_/anchor/tm.htm#8272667]here[/link]. If you machine your own parts, you can obviously make them sturdier, but this was fairly straightforward to mount up. At this stage it will be a solid rear end yes. How big is the engine on that car in your pics? At this stage I have a 1/2 inch solid steel rear axle. 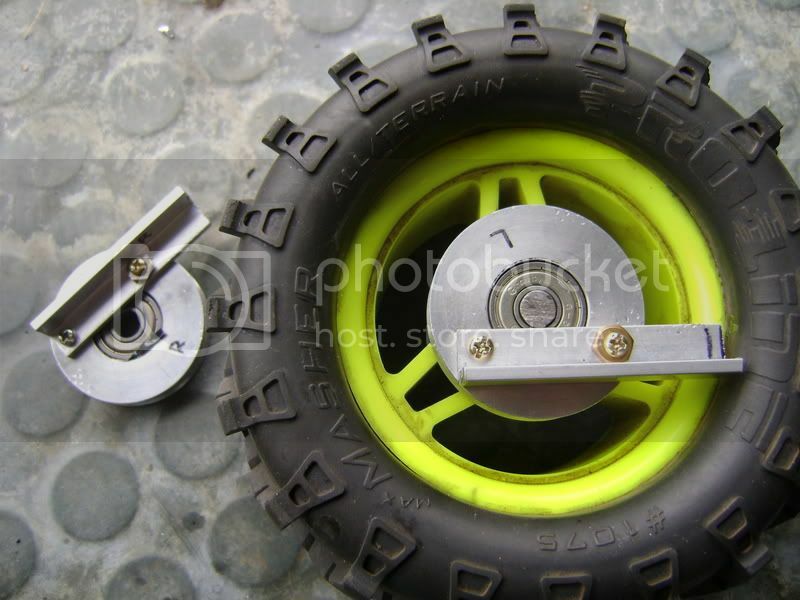 I'm thinking that when I get the proper wheels for it I'll just take the axle in to one of the engineering workshops in town and get them to grind it to the desired shape and size at the ends, and to drill holes in it for pins. My workshop at home is limited to powerdrills, angle grinder, bench grinder and welder. so stuff like brakes, suspension and body isn't on the the cards. I should add that the beach where we live is very VERY tidal. When it's low tide we have about 1.5 k's of flat, beautifully smooth moist sand between us and the ocean. There is plenty of space for a car that might not be that quick off the mark to reach top speed. Well, I better go back to the shed and tinker a bit more. More pics to come at the end of the day. You have all been really helpful. Hey man good work on your rc car. 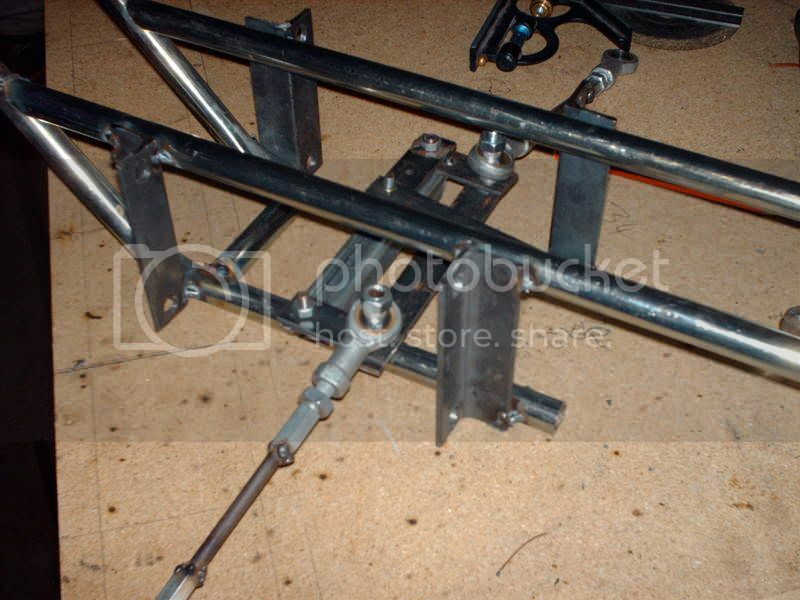 here are some pics of the steering setup I used on the front of my car. Much of it was inspired by what Lars did with the steering on his car. My car ended up weighing a little under 6kg, but with a much smaller, lower powered engine than your using. Yes I've studied it very closely on some other messageboard. I love how you make everything so simple and un complicated and extremely functional. I just weighed it on some dodgy scales. I think it's around the 8 kilo mark at the moment with not much more to be added to it so I shoud be ok, no? Even if it comes in around 10 lilos I mean. Was gonna do some today, but got sidetracked. Ok Ok, give me a sec to get the pics of the camera. Doesn't look THAT different from yesterday. Made engine mounts for the other side and drilled out the holes so I could put a bolt through it. Also, I've decided that the motor is sticking up too much as it is, so I'm gonna tilt it forward 90 degrees. And move it down by the thickness of the aluminium tubing, which is about 25mm. Need to get that weight closer to the ground. Spent a lot of the day working on the engine mounts and playing around with the gears. The engine is from a pocket bike and is 47 cc, so a tad larger than on conventional large scales. 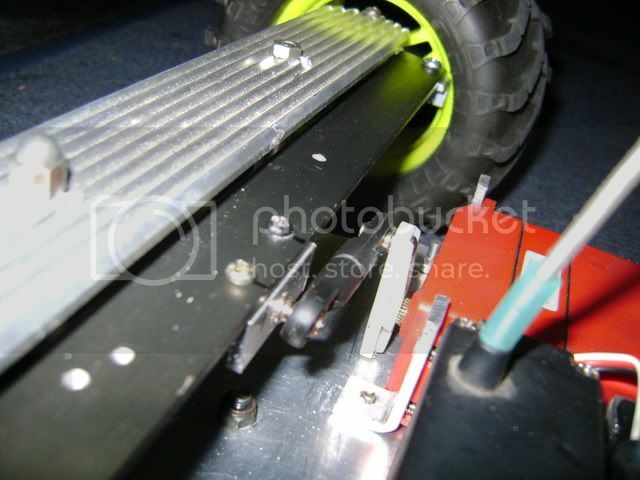 What are you plannnig for the steering servo, btw? I mostly made the rear setup myself,but the gears are from the [link=http://www.rcuniverse.com/forum/m_7970048/tm.htm]FG Marder[/link],here in a onroad version rebuilt by me Its originally an offroad car with bigger wheels and body,there are some pics attached of it in the link.